To experience the Ecovillage with all your senses is an essential element of Sieben Linden’s educational concept. This includes accomodation at site in ecologically renovated low-energy houses or close to nature in own tents combined with the use of an alternative infrastructure, such as compost toilets, solar shower and organic full board with vegetarian (mostly vegan) food – freshly prepared in Sieben Linden and even partly grown in the garden. Prices per night and person are as stated for participants of seminars and for registered single guests, groups or private guests. These Prices are additional to the daily costs for a stay in Sieben Linden!!! Price: 10,- € per person and night. Bedclothes can be borrowed for 5,- € per person. 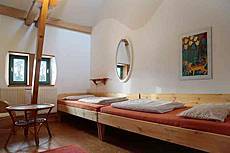 Prices additional to daily costs for a stay in Sieben Linden (see above). This room is suitable for people who are able to walk only with difficulties. It is situated on first floor. Shared shower and toilets are found at the same floor, as well as the seminar rooms and dining rooms. First floor is accessible from the outside by a lift. DSL-Lan available. Please bring your own towel and bedclothes. Price: 17,50 € per person and night. Beds can be booked single, Extra fee of 5,- € for one-night-stays! Bedclothes can be borrowed for 5,- € per person. Spacious, central heated room on first floor with washing basin and two seperate beds. A third extra bed is available, if needed. Shared bathroom and toilets are found at the same floor. Price: 17,50 € per person and night. beds can be booked individually. Extra bed 10,- € per night, also extra fee of 5,- € for one-night-stays! Bedclothes can be borrowed for 5,- € per person. Two rooms on first floor of ‘Nordriegel’ with central heating. Extra beds are available. Shared bathroom and toilets are found at the same floor. 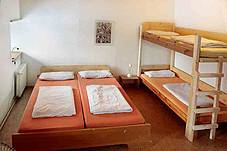 Price: 25,- € per person and night, extra bed 10,-€ per night, also extra fee of 5,- € for one-night-stays! Bedclothes can be borrowed for 5,- € per person. The cosy Bungalow is situated next to the Caravan space. Room I is equipped with a double bed and can be booked as single or double room. Room I and II share a toilet. This room is equipped with a wood stove for heating, firewood provided. The distance to Nordriegel and Regiohaus with their seminar room, eating rooms and showers is about 100m/300ft. Price: 25,- € (single room), 35,-€ (double room), both per person and night. Extra bed 10,-€ per night, also extra fee of 5,- € for one-night-stays! Bedclothes can be borrowed for 5,- € per person. The cosy Bungalow is situated next to the Caravan site. Room II is equipped with two separate beds. A third extra bed is available. Room I and II share a toilet. This room is equipped with a wood stove for heating, firewood provided. 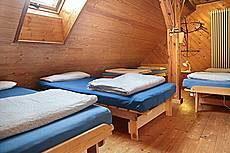 Price 17,50 € per person and night, beds can be booked individually. Extra bed 10,- € per night, also extra fee of 5,- € for one-night-stays! Bedclothes can be borrowed for 5,- € per person. This cosy, converted construction site trailer is situated next to the caravan site. It is equipped with two separate beds and can be booked as single or double room. This room is equipped with a wood stove for heating, firewood provided. Please bring your own towel and bedclothes. Outside toilet next to it. Price: 25,- € per night (singel room), 17,50 € per person and night (double room). Extra fee of 5,- € for one-night-stays! Bedclothes can be borrowed for 5,- € per person. … is a rustic little two-storey building without electricity. It is not insulated (ordinary wooden plank walls) and can not be heated. The hut is equipped with 2 mattresses, an extra mattress can be provided, if needed. Please bring sleeping bag and sheet and, if needed, cussion. The hut is situated in a quiet surrounding near to the garden and pond. Price: 15,- € per night (single room), 10,- € per night and person (2-3 persons) additional to daily costs for a stay in Sieben Linden (see above). The camping site is shaded by pine trees and is equipped with outside toilets and a solar heated shower. 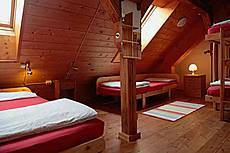 Price: 5,- € per person and night, additional to daily costs for a stay in Sieben Linden (see above). You can park your caravan on the caravan site with access to electricity and an outside toilet. 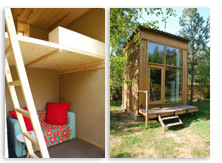 … is a small strawbale building at the edge of the camping ground. The raised sleeping level with a futon mattress for two can be reached by a ladder. Additional there is a convertible sofa-bed for one adult (or two children). Kubus is only heated passively by the sun and has therefor an unstable temperature in wintertime. A hot-water bottle and additional blankets are available. Bedclothes and towel are provided. Outside toilet and solar heated shower are next to it. The distance to Nordriegel and Regiohaus with their seminar room, eating rooms and showers is about 100m/300ft. Price: 20,- € per night (single room), 35,- € per night (double room), every extra person 10,- € per night. Extra fee of 5,- € for one-night-stays! We have two baby camp-beds, if needed. Please bring sleeping bag for baby.